FREE Book! Protecting Organic Seed Integrity. 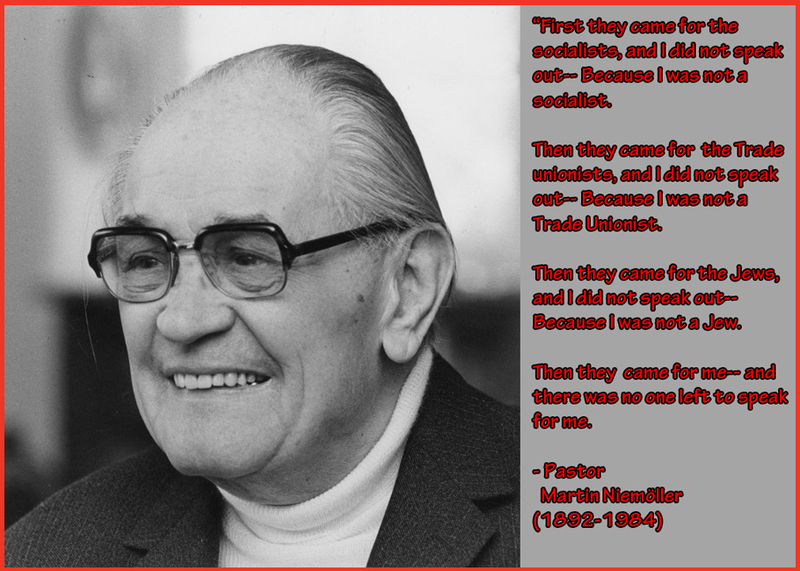 Notable Quotes: Pastor Martin Niemoller on The Wages of Apathy. 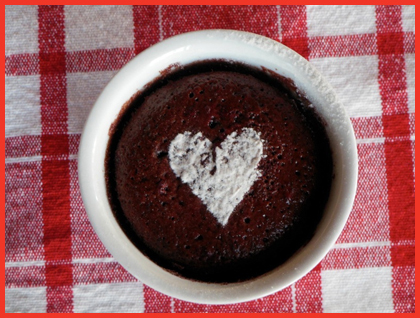 Recipe: Almost Flourless Valentine's Day Chocolate Beet Cake. Special Offer: FREE Organic Dakota Ivory Corn Meal. Mailbox: Health and Wholeness, Explaining 'No Detect' and About Those Market Reforms. From Big Sur to Big Snow. Smelling Sweet Soil (photo credit: NY Times). 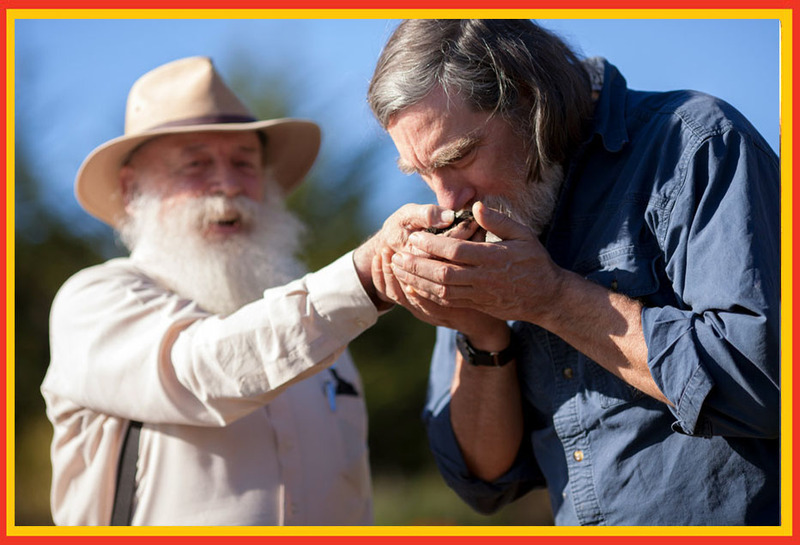 When Jim’s longtime friend Tom Willey of T & D Willey Farms in Madera, California, stated that the Esalen garden soil at Big Sur smelled good enough to eat, Jim could not be stopped from verifying Tom’s assertion. The moment was caught by the NY Times photographer sent to cover the Agrarian Elders Gathering last month at Big Sur on the California coast. Wise Tom was right. You can see this and other photos of the farmer elders at Big Sur when you read the good New York Times article “The Elders of Organic Farming” by talented Bay Area writer Carol Pogash. Breaking News Out of New England This Afternoon. The Vermont Senate Agriculture Committee voted today 4-1 in favor of Vermont’s strong GMO Labeling bill! This is the same bill passed last Spring by a huge margin in the VT House. The bill currently does NOT contain a trigger mechanism delaying implementation until additional requirements are met. Next, VT’s GMO Labeling bill goes to the VT Senate Judiciary Committee for action. Action by the full Senate is expected soon. We expect Vermont to join Maine and Connecticut with successful history-making GMO labeling legislation. New Hampshire and Massachusetts are also hard at work on similar GMO labeling bills. Meanwhile, the potentially precedent setting trial for de-certified Australian organic farmer Steve Marsh - contaminated by Monsanto's GE canola - begins on Monday February 10. The trial over Steve's lawsuit is expected to last 3 weeks and our side believes we have a strong case. With slightly more daylight in the evenings now, Winter is moving along faster and the pace of our organic seed potato shipments is also picking up as Spring comes once again to the southern states. Protecting Organic Seed Integrity. Good book and two ways to get yours FREE. Unveiled at last week’s biennial 7th Organic Seed Growers Conference, Organic Seed Growers and Trade Association (OSGATA) made available to all 430 organic seed farmer attendees complimentary copies of it’s newly published peer-reviewed book, Protecting Organic Seed Integrity – The Organic Farmer’s Handbook to GE Avoidance and Testing. 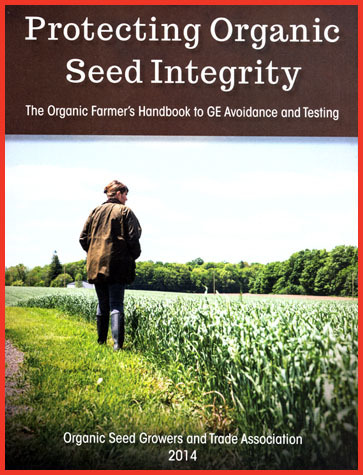 The timely new book is a one-stop tool that organic and non-GE farmers, seed farmers, gardeners, seed companies and seed handlers will find will help them avoid contamination and navigate and master various testing options and protocols so that they do not inadvertently and unintentionally place GE contaminated seed into organic trade channels. The 64-page book is written in layman’s language and was peer-reviewed by three scientists with doctorates and many decades of seed experience. The printed book is also available in an online version available as a FREE electronic download. Interested persons may also request a copy of the printed book at no charge (cost of S & H is $4) by clicking here. 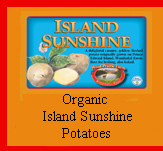 Click Here for our Wood Prairie Farm Organic Certified Seed Potatoes. 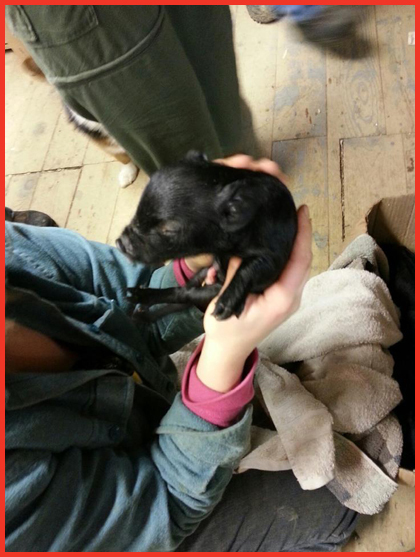 Twelve with one Snow - New Guinea Hog Piglets on Wood Prairie Farm. Wednesday’s snow warmed things up in Northern Maine to the mid-teens above zero. Boo, the oldest of our purebred Guinea Hog sows decided the calm snowy afternoon would be a good time to farrow and gave birth to six healthy piglets. Led by her example, Winnie our youngest sow, decided to follow suit and she farrowed her own six piglets several hours later around 9pm. So our barn is now teaming with a dozen squirming baby piglets. Click here for a YouTube video (0:27) of the baby piglets nursing, nested and snug next to Boo under dry hay bedding in our barn. The American Guinea Hog is a recognized heritage breed noted for a very mild temperament and its ability to thrive on grass, hay and vegetable waste and virtually no grain. Guinea Hogs are the perfect pig breed to raise for family pork because if you have a modest grassy patch and a garden with some excess vegetables you can raise excellent, tender meat with a major reduction in the purchase of expensive grain. Along with growing organic seed potatoes and other crops we raise and sell registered purebred certified organic Guinea Hogs for both breeding stock and for meat animals. If you are interested, please call or email Megan (orders@woodprairie.com). Click Here to Watch Any of Our Other 36 Wood Prairie Farm You Tube Videos. Guinea Hog Piglet Warming Up in Office. Now eleven more where she came from. Combine chocolate and butter in a bowl set over barely simmering water. Stir until chocolate mixture is melted and smooth. Let cool to room temperature. Whisk together the egg yolks and sugar until light and well-blended. Whisk yolks and sugar into chocolate mixture, whisking well. Stir in the pureed beets and spelt flour. Beat egg whites with an electric mixer until soft peaks form. Gently fold egg whites into chocolate mixture until just combined. Pour batter into 6 - 8 greased cups. Bake 15 minutes. Centers will jiggle slightly when done. Cool on a wire rack. Sprinkle with powdered sugar to garnish. We received two excellent reports today from the GE content testing lab! 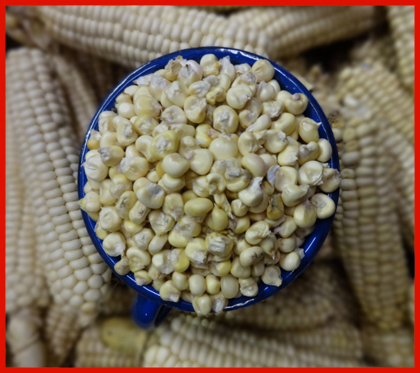 Both our 2013 Wood Prairie Farm organic corn seed crops passed with readings of “No Detect” - that would be both our Organic Dorinny Sweet Corn Seed and our Organic Dakota Ivory Flour Corn Seed. This “No Detect” reading means that in both cases, the submitted representative 10,000 kernel samples passed with flying colors: not a single kernel of the requisite 20,000 kernels we sent contained genetically engineered genes. Had we experienced an invisible GE contamination incident, the state-of-the-art laboratory PCR test would have detected that GE contamination. Because of the prevalence of GE corn crops across the United States there are many locations where contamination – primarily via pollen drift – is difficult to avoid because of GE corn crops grown in close geographical proximity to organic and non-GE crops. Our isolation on the edge of the North Maine woods is incredibly valuable for growing seed of at-risk varieties like organic corn. At Wood Prairie Farm, we have ALWAYS had a policy of refusing to sell as organic seed any seed lot which tests hot for GE content. 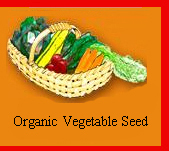 We believe that is what you expect as our seed customer and that is what we will always provide to you as your organic seed company. If you have not yet enjoyed our Organic Dakota Ivory Corn Meal you are in for a real treat. The fresh taste of this short-season northern flour corn will amaze you. Dakota Ivory was bred by our North Dakota friend and well-respected organic seed farmer Steve Zwinger. Here's your chance to earn a FREE 2 lbs Sack of our Organic Dakota Ivory Corn Meal (Value $13.95) when the value of good in your next order is $60 or more. FREE 2 lbs Sack of Organic Dakota Ivory Corn Meal offer ends Midnight Monday, February 10, 2014, so better hurry! Please use Promo Code WPF1170. Your order must ship with FREE 2 lbs Sack of Organic Dakota Ivory Corn Meal and entire order must ship by 5/8/14. Please call or click today! Organic Dakota Ivory Corn. Makes the very best corn bread anywhere. Our Mailbox: Health and Wholeness, Explaining 'No Detect' and About Those Market Reforms. 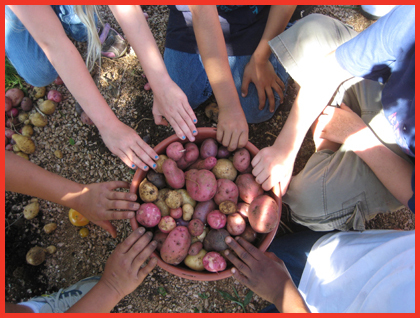 Here are some photos of harvests over the last few years from Wood Prairie Farm Seed at the Austin State Hospital Children and Adolescent Garden in Austin, TX. Thanks for everything!! Thanks so much! You have put together a recipe for health and wholeness. I am confused...have the labs developed new testing standards? In my last round of testing with Genetic ID non-detectable did not mean 0% content but rather they could not 0% accuracy/precision. OSGATA's policy on GE contamination of organic seed states that no seed should be called organic if any GE content whatsoever is detected in the test sample. The phraseology of this policy is either "No Detect" or "Not Found In." The current state-of-the-art procedure is a 10,000 kernel PCR test which is capable of detecting down to a single kernel which has GE content (0.01%). If GE content is detected, our OSGATA members feel it should NOT be sold as organic seed. We agree. Testing for GE is destructive in nature in that the 10,000 kernels are destroyed by the testing procedure. So the only way one could determine with 100% certainty that a 10,000 bushel grain bin had absolutely zero percent GE content would be to test (and destroy) each and every kernel in that bin via many many thousands of expensive ($200) PCR tests. Obviously, that would be anything but practical. So, instead we employ the best representative sampling techniques which meet the requirements of sound statistical analysis. This is ethical, scientifically justifiable and is what we mean when we refer to a 'No Detect' standard. Unfortunately, this testing protocol is an expensive procedure. Innocent victims at risk of contamination through no fault of their own should NOT have to foot the bill which is polluter Biotech's responsibility. However, the reality is the victims are now and have been forced to pay for this testing alone and that MUST change. Additionally the Biotech industry should have to pay for the extinguished value of the organic crops they have recklessly polluted and ruined. The monetary losses are huge for the organic community. You mentioned "market reforms which pay fair farm-gate prices to farmers who produce good clean food" - can you elaborate on what you mean by that? Here's one reality. A lot of farmers sell to food companies which manufacture processed food from the farmer's raw crop. The farmers I know who sell this way are often exploited by the food corporations. The farm gate price they receive is low, particularly in relation to the generated product value at retail. I can offer two examples. Friends who raise organic soybeans receive $20-30/bushel. When that bushel of soybeans is turned into organic soy milk the value of the soy milk at retail is $500. Example two: local conventional potato farmers who sell to our local french fry factory. The farmers receive less than $3000/acre for their potatoes, about equal to what it actually costs to raise an acre of potatoes in a normal year. We don't see "normal" years very often any more. When that acre of potatoes is processed, it makes about 16,500 lbs of french fries. Valued at $6/lb when sold at fast food restaurants, that acre's worth of french fries generate approximately $99,000 at retail. If all those french fries were sold in the State of Maine where there is a 7% Meals Tax, the State would take in $7000. Remember, the farmer doing all the work and paying for all the expenses in raising a crop gets less than $3000 for that acre. Bottom line: there must be more equity. The farmers responsible for all of our nation's food abundance deserve to be treated fairly in the economy. If family farmers were paid adequately so they could earn a decent living, we would have plenty of farmers and they would grow plenty of food.